As all our items are all individually made there may be a slight variation on patterns and colours from those seen in the photographs on our website. Your order will be delivered by Royal Mail recorded delivery and will be insured for the sum paid. 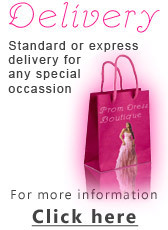 We charge a standard £9.99 per dress for delivery within the UK. £14.99 delivery per dress for delivery in Europe and £24.99 for delivery anywhere else in the world. Handbag delivery is free of charge. Please be aware that recorded delivery requires a signature upon receipt. Should you be unavailable to sign for the parcel it will be taken to a postal depot and you will be required to either collect it or arrange redlivery. We aim to deliver as soon as your order is processed and you will be informed of your delivery date and estimated time of arrival. 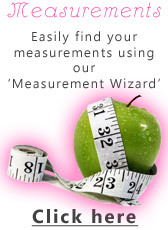 If your item is not in stock we will endeavour to obtain an approximate lead time for your delivery. Where a dress and accessories are ordered we will dispatch all items in the order together, once the dress has been made. Cancellations must be made prior to orders being dispatched and, in the case of made to measure dresses, before the material is cut, which can be within 7 days of the order being placed. Should an item arrived damaged, it will be replace free of charge, if for any reason we are unable to replace your item a full refund will be issued. Please inform us within 48 hours of delivery of any damages, items MUST be returned in their original packaging. Failure do so may result in us refusing a returned item. We operate a comprehensive guarantee policy, in addition to, and not affecting, your statutory rights. 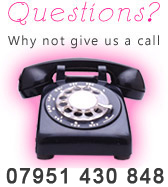 If any item is found to be faulty we will replace it free of charge. For items that are bought from stock, if you decide within 7 days of receipt that you no longer want the piece then we will refund or exchange to the value of your order. In this case, we will charge for return postage. In the case of made to measure dresses, the distance selling regulations do not apply as the dress is made to your specific measurements. There is no exchange or refund unless we have made a mistake in the size, colour or style from that which was ordered. You must inform us of any problem before the return of a made to measure item. Returned items will not be accepted unless they have been authorised. We accept no liability if you return goods by any method other than a signed for delivery method (one that requires a signature upon receipt). In any event, we accept no liability in respect of returned goods unless and until such returned goods have been received by us in their original condition and in their original packaging. Please make sure that the returned package is properly secured. A refund will be issued upon inspection of the returned goods, having found them in perfect condition we will refund immediately. If however the goods have been damaged by your carrier it will be your responsibility to claim from the carriers’ insurance and no refund will be issued by ourselves. This site is owned and operated by Prom Dress Boutique (also referred to in these Terms as "we" and "us") and the information and materials appearing on the website (the "Content") are displayed for personal, non-commercial use only Website design, text, graphics, audio and video, and the selection and arrangement of the Content is the property of us or our suppliers and is protected by international copyright laws.